November | 2013 | Frank & Donnis Travel Blog "the more we see the more there is to see"
Just another workday for me. Donnis had a day off so she drove to Moree, a 300Klm round trip. She had several reasons to go. The air conditioner in the accommodation is a central unit and does not work well and is often turned off by the other nurse because she does not like air con especially when she is sleeping. So, when the other nurse turns the AC off no cool air gets into Donnis room. With temperatures expected to reach 50° over the coming months, she will need AC especially when she finishes night shift and needs to sleep during the day. Donnis wanted a portable unit, one she could plug into power and has its exhaust air vented through a window fitting. She also bought block out curtains to make the room darker during the day. Her mobile phone will not work in a remote rural area. She needs a “blue tick” phone, capable of receiving weak signal. At the same time she can upgrade to a smart phone and a data package. After discussion she has a new phone, a car cradle and charger, a home base station charger and an external antenna. She needed groceries and cooking utensils. For some reason a juicer was on her shopping list. The bank account took a severe battering when she had finished. With her new phone the CO-PILOT is able to call any time of the day or night but so far she has not mastered the intricacies of the data package. For example, email, facebook and skype. On my way to work I got a call to say my rebuilt AC compressor has arrived so dropped RALLYE at the workshop. Just as I finished my shift they phoned to say it was ready. Oh Joy! Oh heaven! Oh delightful! Oh bliss! I can drive with windows closed and it is cool inside. As a bonus I can hear the radio. The CO-PILOT called. She and her room mate drove 300 Klms round trip to Lightning Ridge and back to Colli as Donnis has night shift at 10.30. We had been to Lightning Ridge in 2010 and I am sort of jealous as we both liked the town and we wanted to return. She still has not mastered data and we discovered the patch kit for the external antenna is the wrong type and will not fit her phone. A nurse at the hospital is going to Moree and will return the patch kit and ask them to mail it back to Donnis as the nurse is going on holidays and will not return for several weeks. Another overcast day in Airlie Beach including a late afternoon of thunderstorms, lightning and rain. It is hot in Colli and the CO-PILOT is ecstatic about her new AC. Learning to use data on her phone is still an elusive task especially as there is lots of looking around Colli, swimming, meeting people and forging friendships. The day started overcast and became greyer, if that is possible as the day wore on. Weather forecast is for RAIN. Not showers, RAIN! Rain for several days. 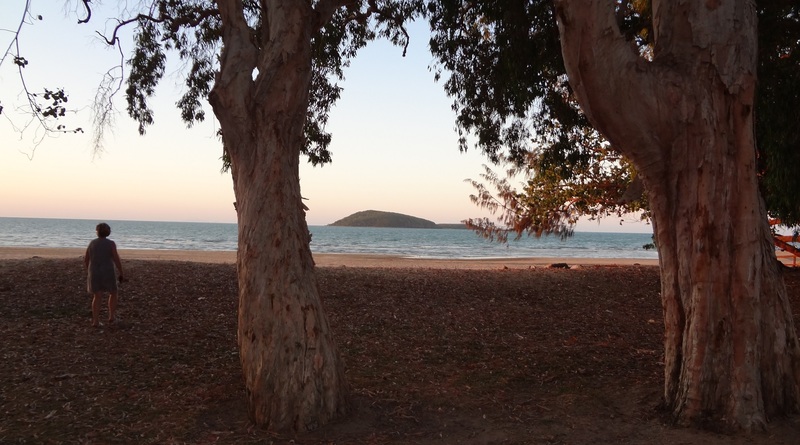 In the early afternoon I drove to Shingley Beach a delightful manicured park, saved from obscurity by the Whitsunday Shire Council. 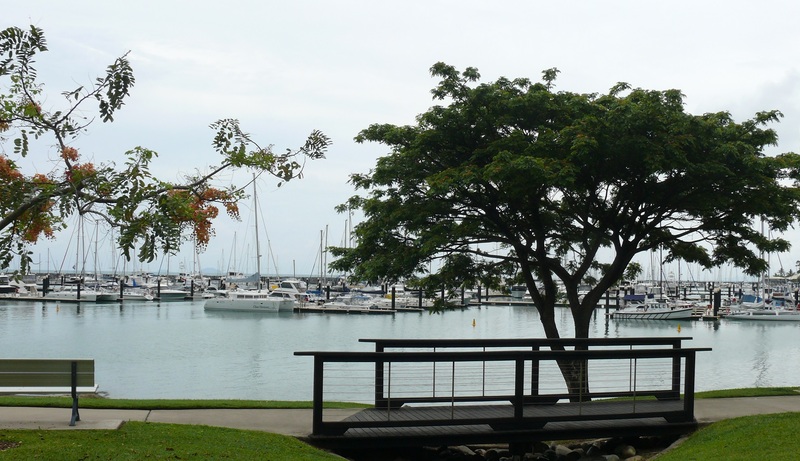 The park overlooks Abel Point Marina, a block of multi-million $ units, Peninsular Airlie Beach at Abel Point. 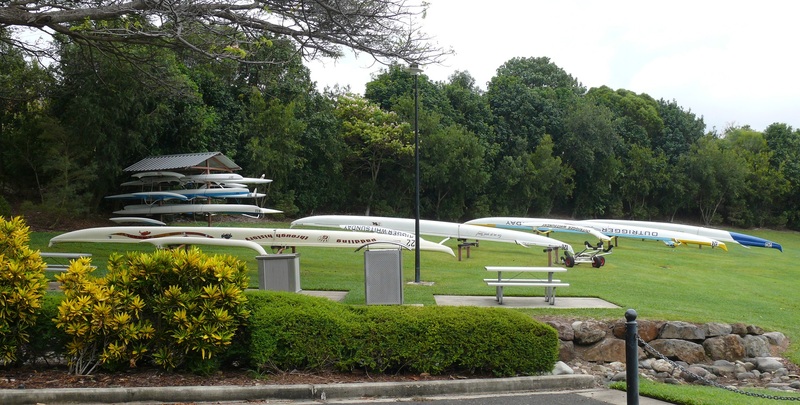 It is also a placed for the outrigger canoe club to store their umm err outrigger canoes. Outrigger storage area at Shingley Beach. There are showers toilets, picnic tables and a small rubble/sand beach. The afternoon was heavily overcast and not great light for photographs. Just after 7pm the rain began…heavy rain which continued all night, well at least those parts of the night when I woke and heard the rain. I could hear the creek behind WWWGO gurgling as the water rose and race on its way downhill towards Watering Horse Creek and into the Coral Sea. I dreamt that somehow Donnis and I were crossing a flooded raging creek and the bridge we were on collapsed and we both ended in the water clinging to a steep slippery bank. I called to her to join me and as she let go the handhold she sank and disappeared. That is when I woke with a fright! It was 4am and still dark outside. At first light I could see how far the creek had risen during the night. The water was rushing along making flooded creek sounds. Perhaps the sound of the creek penetrated my subconscious and created the dream. It was still raining, just as heavily as when it started last night. We have developed a leak around the roof hatch. Or is that the same leak which has plagued us for two years? Whatever it is it only leaks when we have very heavy rain and where WWWGO is perfectly level so water cannot easily run off. Outside I discovered the unlidded plastic box in which I keep several pairs of shoes had not been fully pushed under the shelter of WWWGO. All the shoes were wet and sitting in a puddle of water. I also chose today to defrost the fridge and while my back was turned, the defrosted material leaked out of the open fridge door and soaked all the floor mats. I hate living with damp carpet and mats under my feet. They seem to take only a short while before they smell, umm err damp! I can take them out of SWWWGO but as it is still raining outside I cannot dry them out just yet. In the afternoon I bought some tent poles and if tomorrow is a bit dry I will extend the shade cloth which currently just hangs down and although it provided shade on the dinette and fridge side, it does not allow a free passage of air. I should be able to park RALLYE under as well. Woke to sunshine with birdsong at 5am. After getting mats and shoes into the sunshine to dry I then tackled the shade cloth. Yes! Rallye will fit in…just. 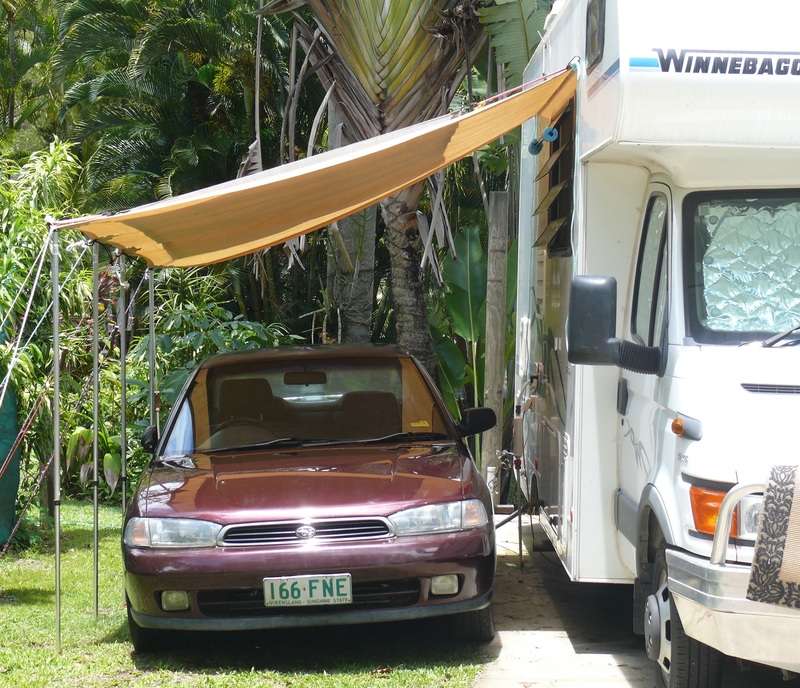 I added a tarpaulin on top of the shade cloth and parked RALLYE underneath. It will now get some protection from the sun and even some protection from the rain. We also get a cooled breeze through the dinette window. 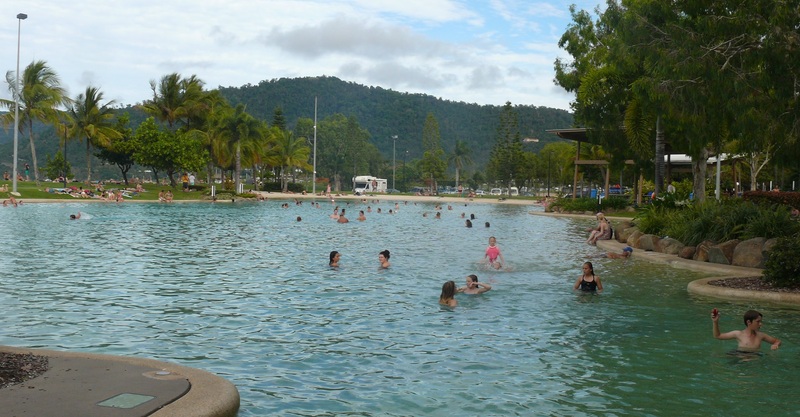 In the afternoon after I had completed my chores it was time to relax and drive into Airlie Beach. I felt it would be safe to do so as Schoolies Week (http://www.schoolies.com/2013) is over and most, if not all, have gone home. Umm it’s not that I thought it would be unsafe but more a case that I am more likely to find a parking spot now that all the party goes have gone. By way of explanation, Australian school leavers gravitate to places such as Airlie Beach, Gold Coast, Sunshine Coast and Byron Bay. In the week of madness there is lots of music and rampant testosterone fuelled by too much booze and drugs. Any brains the schoolies had to enable them to graduate seem to have been left at home. Fights are normal. Apart from that they all have a good time, carry those memories with them forever and go home at the end of the week. I walked around the lagoon, a giant free open swimming enclosure for (well yes it is free to the visitors, the locals pay for it by way of council rates and by way of an impost on local stores) swimming, relaxing, family play area, barbecues with some of the best weather and views on the planet. I then walked around the rocks and mangroves on the north side of the beach. 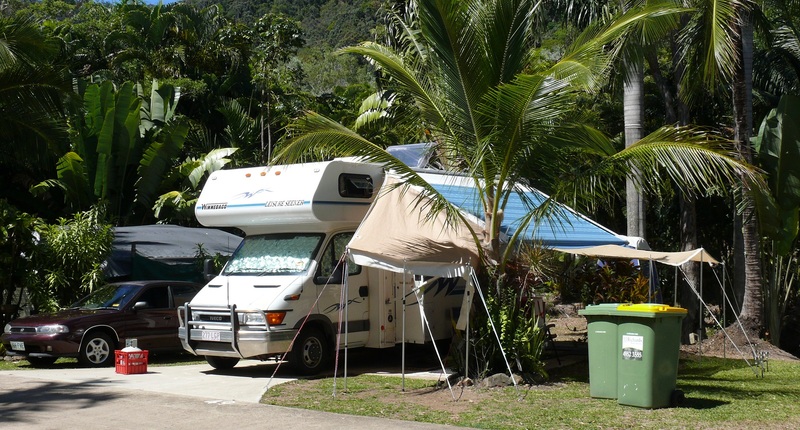 Walway which begins at the Boathouse just on the road to Shute Harbour and follows the coast along Airlie Beach, through to Coral point through to Abel Point Marina, Shingley Beach all the way through to Cannonvale Beach. If it was not so hot and humid I would do the walk. In fact I may just do the walk early in the morning on one of my days off. 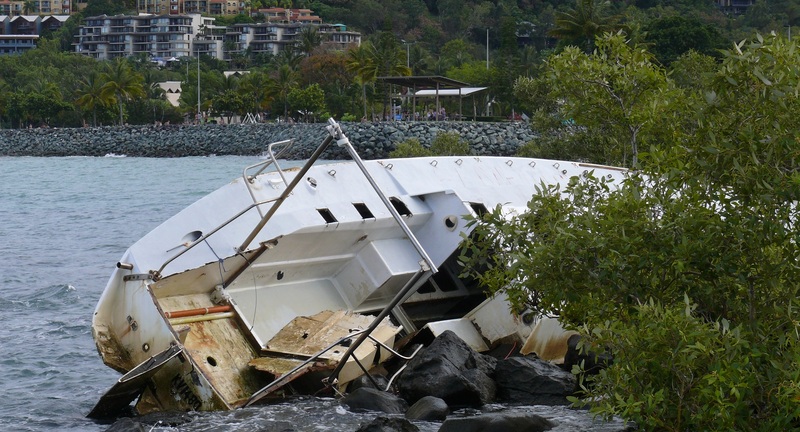 There is a boat wreck here, washed up on the rocks during or after ex tropical cyclone Oswald in January 2013. 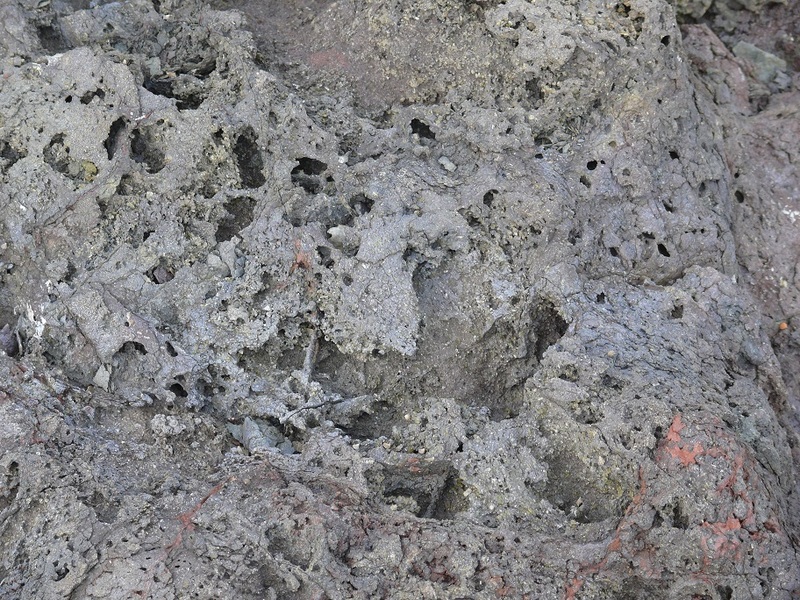 Volcanic Rock on Coral Point. Now the late afternoon black storm clouds began rolling in and it is time to batten down the hatches and put my shoes and chairs somewhere they will not get wet when the rain begins. The warning thunder began just before 8pm. Hogs Breath Cafe, Main St, Airlie Beach. Most Australians would have heard of Hogs Breath. What they do not know is this is the traditional original home of Hogs Breath from where all the others began. I have been distracted this week. Read on to see why! On Friday we had booked RALLYE into an air conditioner specialist for a quote to retro fit air conditioning. We thought if work is offered out of town, Donnis would be better off driving an air conditioned highway car. Of course they need a compressor and even after market non genuine parts are not available. Anyway they were / are having trouble locating the part and the last Subaru they worked on, the compressor was sent to Rockhampton for a re-build. Armistice Day. Observe a minutes silence at 11am! I had my head down at work, doing umm err, work and failed to realise the time. Everybody else in the office forgot also. We spoke with the air con people, could they get the job done by tomorrow night? Noooooo! They need a compressor and the one they want is as scarce as hens teeth. The CO-PILOT is considering taking the RALLYE even without air con as it is a faster smoother car on highways and corners like a race car. Trouble is it is very hot and humid here and will be hotter at COLLI, so air con might be essential. Well no way will RALLYE be fixed in time. In fact it is beginning to look like air con is not going to happen at all. Today we received the contract and supporting documents – all 18 pages – which were printed, read, completed, signed, scanned and sent back to the agency for onforwarding to the hospital. Tonight is our last night together for three months. We have not even had time to make plans to meet each month or where or what to do about Christmas. Donnis is excited as it will be a challenge and will help maintain her nursing skills and she will get lots of experience as the hospital handles all cases and then sends patients to Walgett or Moree (the biggest nearby town, 140 Klms by road) if they cannot be treated locally. She is scheduled for her first shift on Saturday afternoon. The rest of the afternoon and evening she spent packing and readying TERIOS for tomorrow. Sob Sob Boo Hoo!!! We said our goodbyes this morning and said them again just as it was time to leave. Me to work and her to start the loooong drive. More Boo Hooing and sobbing can be heard in the background. I arrived home from work to an empty WWWGO. Sob sob boo hoo. Most of Donnis clothes, shoes and funny spices and oils and medications are gone, so are her pillows. Her presence is still here but just a diminishing wraith like aura. We had agreed she would send text messages after she stops for fuel or meals so I can track her progress and estimate travel times and distances for tomorrow. Sigh!!! Her first text was sent from Mackay an hour later than expected. The next message was from Rockhampton two hours later than planned. She is having an easy drive and not keeping to a time frame, she will stop for fuel, meals and coffee as and when and for as long as she needs. In the meantime… The water at the caravan park tastes, “different”. It is not town water but rather bore water and according to Joe the owner, if we use it to wash the car we should dry the car immediately otherwise we will end up with calcium streaks. Hmmm! That may explain why when drinking tea there is a gritty residue in the bottom of the cup. This prompted me to look at the new electric kettle we bought last Friday. Hmmm! Already there is a build-up of calcium scale much thicker than I would expect after a short time. I can see some of the scale is loose and swirls in the bottom of the kettle. It needs a good clean out and a de-scale. From here on in I will drink bottled water and use it to make tea and coffee. Twelve litres only costs $7. 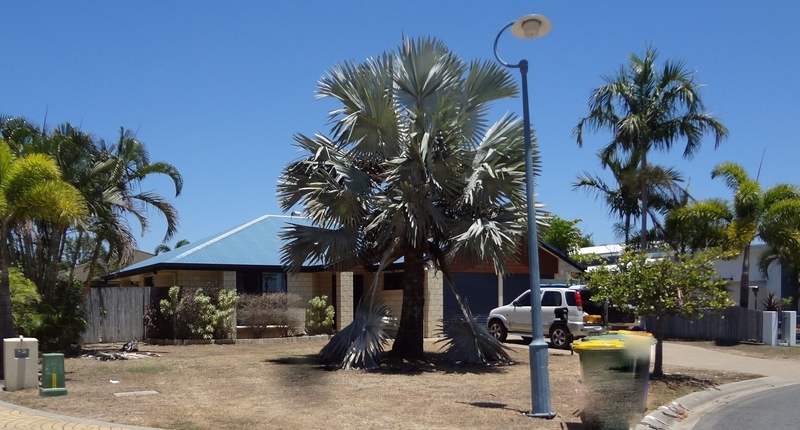 Tonight Donnis arrived in Banana, a small town on the Leichhardt Hwy 650 Klms from Flametree. She is in a 24 hour hotel and dining room, mostly frequented by truckers and travelling sales people. http://en.wikipedia.org/wiki/Banana,_Queensland She was excited that once off the main Bruce Highway and on the inland open plains A5 Leichhardt Hwy she felt exhilarated. The plan is for her to drive another 500 Klms tomorrow with Goondiwindi on the Queensland NSW border as her target destination. That will leave a less than 300 Klm drive to Collarenebri on Friday. When we, finally made contact tonight Donnis had arrived in Moree NSW, 125 further than the planned destination of Goondiwindi on the Qld, NSW border. 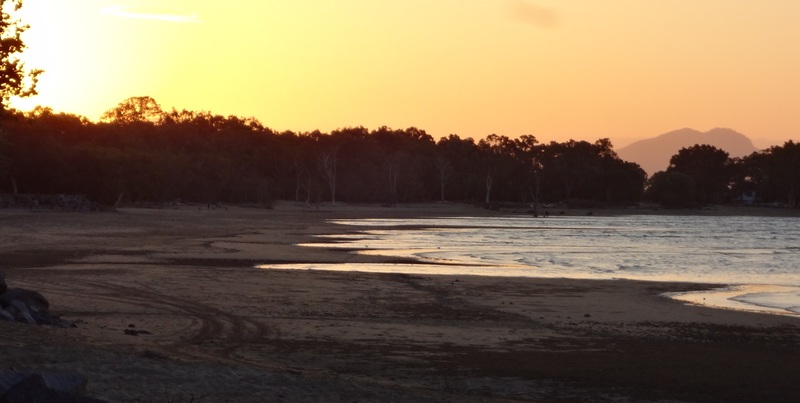 She decided to push on past Goondiwindi because it was still light and she wanted to swim in the thermal pools for which Moree is famous. She only has a 140 Klm trip tomorrow. Donnis has arrived in Collarenebri and started moving all her belongings out of TERIOS and into the unit she will share with another nurse. Tomorrow begins her first shift at the hospital. I drove to Mackay and researched a new phone for Donnis. Her current phone does not work in a remote rural area. She needs what is known as a “blue tick” phone. http://crowdsupport.telstra.com.au/t5/Coverage-Network/How-much-difference-does-the-quot-blue-tick-quot-make/td-p/24936 In the evening I joined my sister Enid’s family for a barbeque and afterwards stayed the night at my sister Sandra’s house. During the barbeque a heavy duty storm cell rolled in with lots of lightning, thunder and heavy rain. This morning I attended St.Brendans Catholic Church at Bucasia. 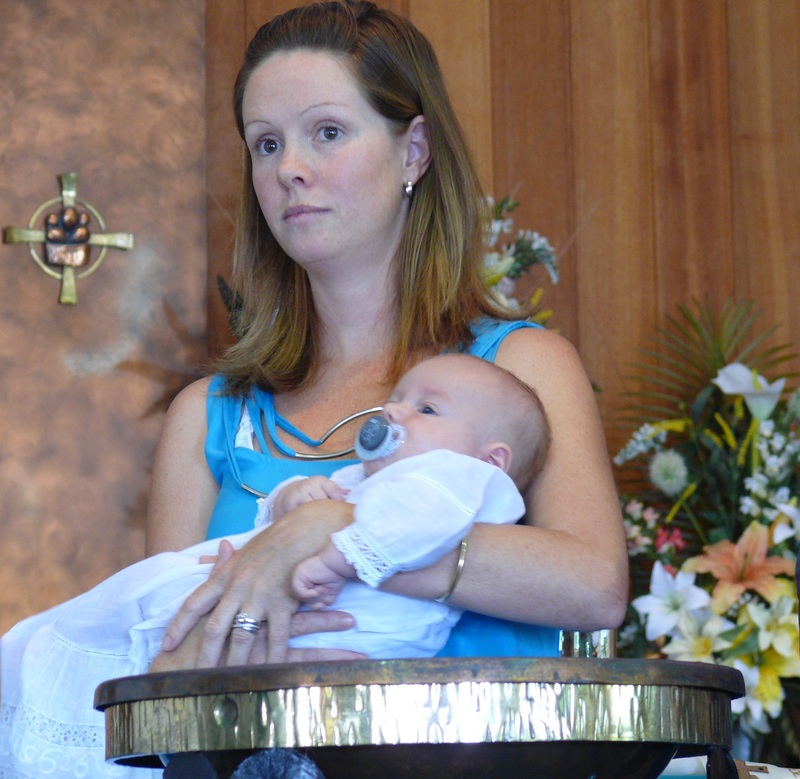 Neice Kelly’s two boys, Cooper and Oliver were being Christened. Cooper and Jason. Doncha just luv Coopers tie? Afterwards I joined family at Kelly and Jasons house for a late breakfast. 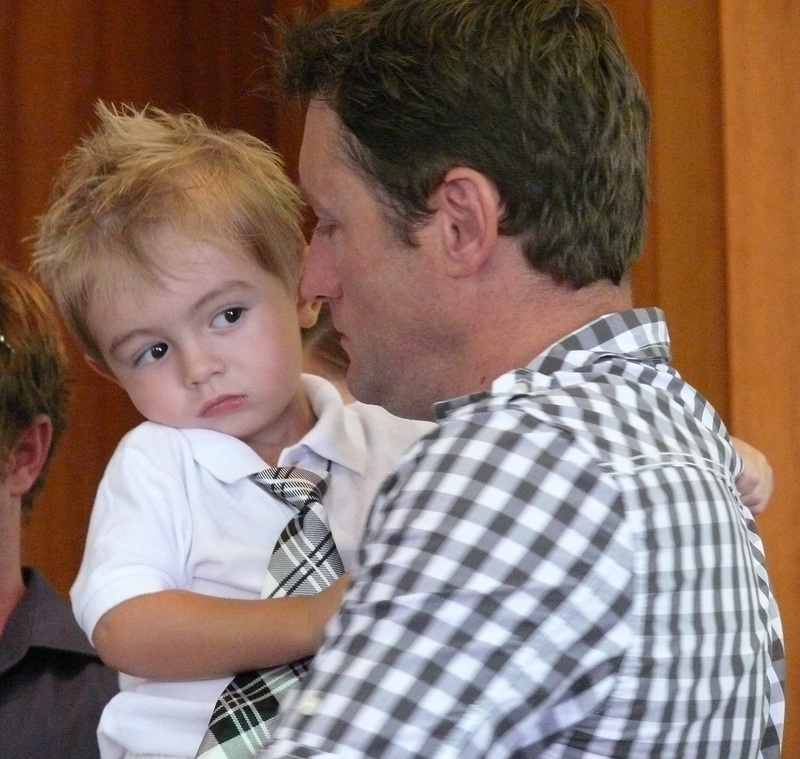 Thanks for the invite Kell and Jase it was a lovely ceremony and an enjoyable breakfast spent with family. Back at WWWGO at Flametree another storm rolled through at dinner time and dumped lots of rain. Of course it was accompanied by wind and everything outside got soaked. Today was Frank’s first work day. Five hours went by so quickly despite me still trying to remember how to use the various systems. I only managed to 90% complete one file and 50% complete another two. All three will be finished tomorrow. I could not expect to just jump in and start work as if three years of retirement had not happened. Still I am comfortable with what I have achieved and will build on that tomorrow and over the coming days and weeks. Melbourne Cup Day. “The race that stops a nation” http://en.wikipedia.org/wiki/Melbourne_Cup For our overseas readers I should explain that people who normally do not take any notice of a horse race, suddenly read the form guide and must be sitting before a TV to watch the big event. People who do not gamble suddenly become experts on race horses and bet at the local TAB (https://www.tab.com.au/#!/nsw ) and enter as many sweeps (http://en.wikipedia.org/wiki/Melbourne_Cup_Sweeps as they can find, in fact if there are no sweeps these mild mannered non gambling types will make a sweep of their own. People who do not go to race tracks suddenly want to dress up and go. 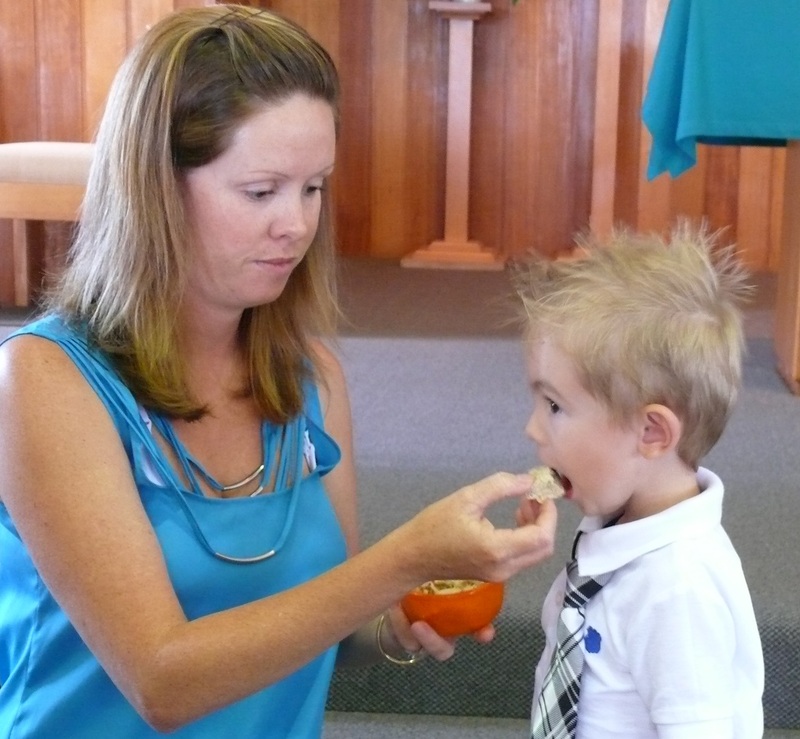 Others who cannot get to the racetrack get dressed up anyway and go to Melbourne Cup parties. For many it is just another excuse to have a big booze up. The rest of us just have lunch and watch the spectacle on TV. Maria (the boss) took the ladies from the office to a Melbourne Cup Luncheon at a restaurant at Airlie Beach. Us boys kept the office running and had curry lunches brought in. Of course nobody phones or calls into the office on a day like today. After the big race the remainder of the day is spent dissecting and post morteming the race and tactics and winners and luckily for me my shift was completed and I could escape to the sanctuary of WWWGO. Yesterday I removed the driver’s seat from RALLYE and this morning dropped it off at the upholsterers. Given the car is 18 years old, the seat springs had finally given up the job and collapsed making for an uncomfortable drive. By lunchtime the seat was repaired, almost as good as new. I also bought new floor mats after I finished my shift and spent the first hour back at camp installing the seat and cutting the mats to size for my floor pan. The seat and new mats look good. I will give all the seats a good shampoo on my first day off. I have finished four days of work! Wow! In the afternoon I go back to WWWGO and The CO-PILOT and I have a swim in the Flametree pool. It is very relaxing and surprisingly quiet here. Yes, quiet. Despite the airstrip next door with planes and helicopters coming and going it is not constant noise.  Can I take my poodle on the Crocodile Safari?  Where do the fish go when it rains?  Where do the fish go at night?  What stops the islands from floating away?  I have to cancel my Whitsundays trip, as no one told me it departed from the Whitsundays.  Do you get wet when you snorkel?  Is Hayman Island on Hamilton Island?  I’m arriving in two months. Can you tell me the weather for that week?  How does the washing machine work? Should I separate colours? Hmmm! They walk among us and they BREED!!! Woohoo. My first day off and the beginning of a long weekend. I started doing a bit more tidy up on RALLYE by shampooing the seats. As the shadows began to lengthen I started the job I had been putting off. I put the job off simply because I was not sure how to replace the old overhead hatch blockout screen. I had bought a new roller blind in Mackay two weeks ago and knew I would have to cut it to size. I was more concerned about how I would rewind the spring tensioner. As it turned out, with help from the CO-PILOT we had the job completed in under an hour. We are both very pleased with the result. The old screen was pitted with holes from leaves and seeds which had fallen out of trees and when the screen was retracted the seeds punctured the material. It was not in good condition when we bought WWWGO in June 2009 but has become worse as the years go by. Now it is a pleasure to look at the new screen. The hatch has two way screens. Pulled one way, out comes the blockout curtain, pulled the otherway and out comes a very fine insect screen mesh. I took the opportunity while the complete unit was out of the ceiling to wash down the frame and the insect screen. In the afternoon we went for a swim. It was a hot day. In fact every day has been hot but since I rigged the shade around our campsite it is pleasant sitting outside with the breeze cooled by the shade. 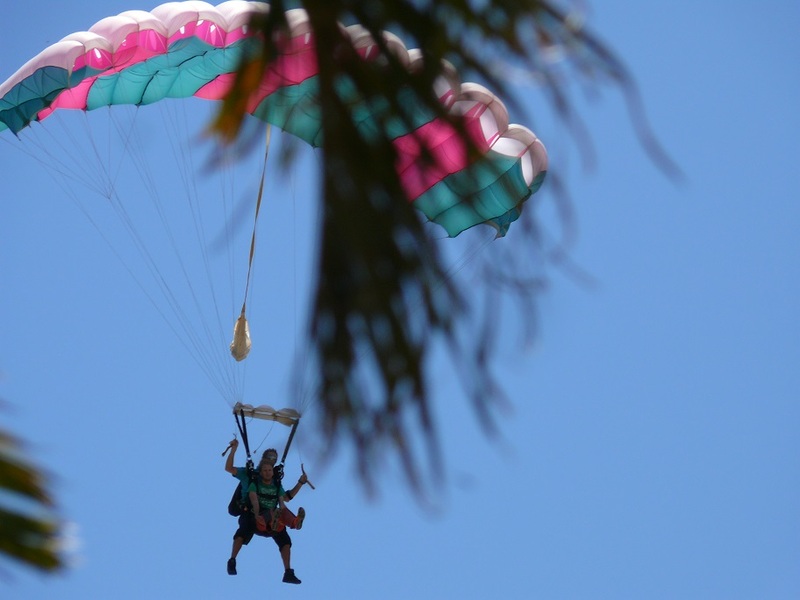 During the day we can hear and see the tandem skydivers jumping out of a perfectly good airplane. We first hear the sound of an opening parachute sort of like a flapping bedsheet on the clothesline in a strong breeze. Then we hear the sounds of terror as they swing around in the sky while the parachutist guides them to the landing zone about 15 metres from our campsite then we hear them when their terror screams turn to excited screams and finally the flap flap flap of the trailing edge of the chute before they land. 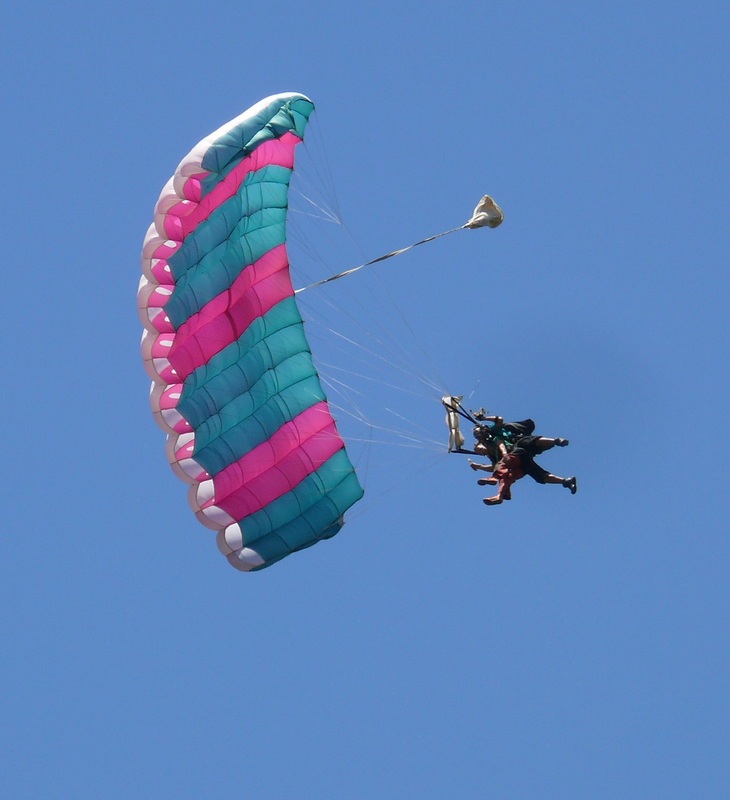 They come in at such speed you think they will crash but at the last moment the parachutist lifts the front edge and they gently touch down, the parachutist on his feet while the tandem person lands on their bum. No matter how many times a day we see them, we never tire of the activity. In the afternoon I drove to Funnel Bay to catch the sunset. Funnel Bay looking north towards Armitt and Double Cone Islands. 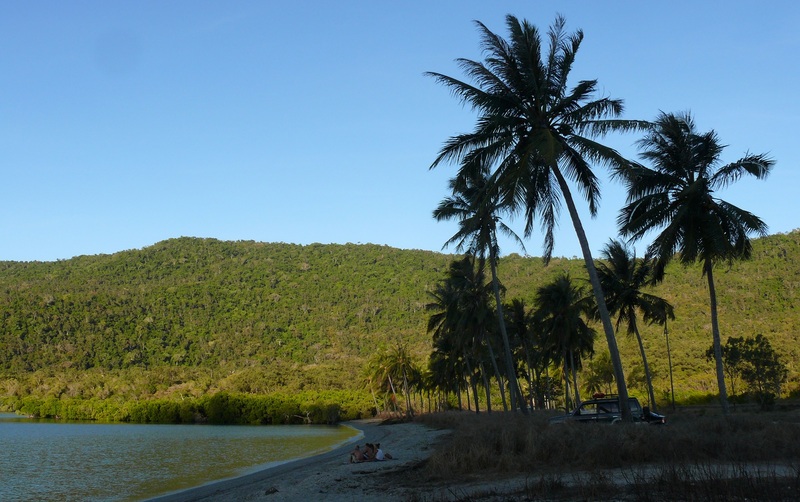 Funnel Bay is a small beach surrounded by rugged hills of the Conway Range. 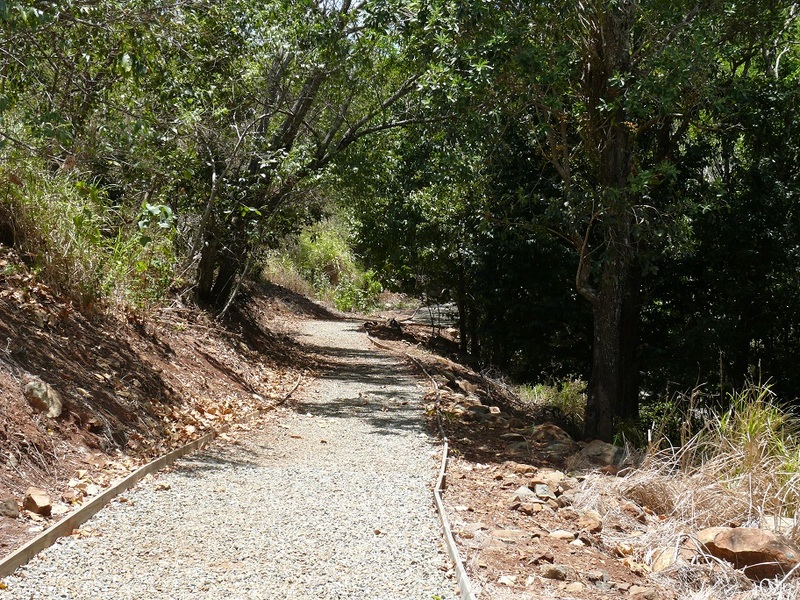 It is accessed by a rough gravel track which is often impassable during the wet and or at high tide as a deepwater creek, Watering Horse Creek passes along one side and it often overflows across the track. The creek, although tidal, is fed by several other creeks, one of which is Flame Tree Creek which also runs through the van park. Several years ago a developer started building what was to be a resort at the beach. As often happens, developers usually have more vision than money and the work fizzled out and a big cyclone wire fence erected to keep people out. Somehow the “people” managed to encourage the fences and gates to fall down at strategic locations. Access to the beach is open again for those keen enough to risk the road in. It is used by families, fishermen and boaties. The land, about 24 hectares is available for sale with the intention of turning it into 574 beachside or hillside building allotments. 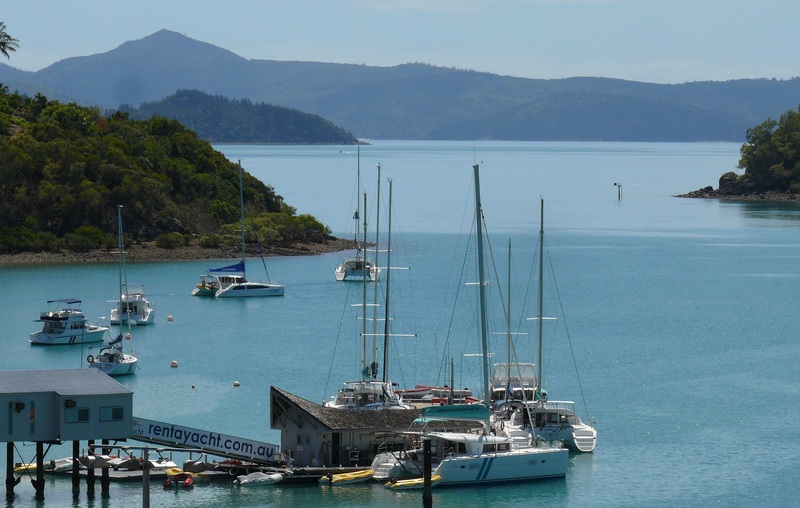 http://www.whitsundaytimes.com.au/news/funnel-bay-back-on-the-market/393359/ All it needs is another visionary with no money. 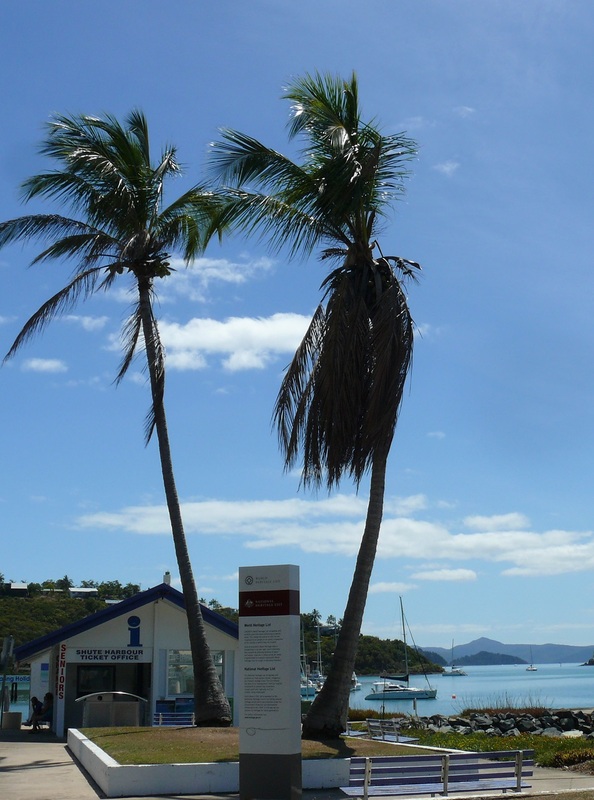 Funnel Bay is also ideal to use as a line up guide for pilots landing at Whitsunday Airport. 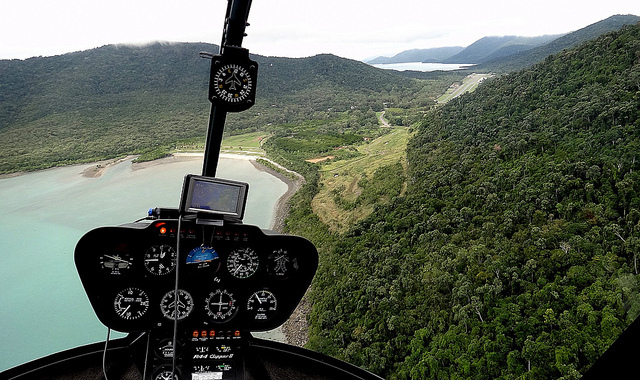 Aerial approach via Funnel Bay to Whitsunday Airport upper right. This morning I drove to Shute Harbour, described as the 2nd busiest port in Australia. Shute Harbour with sign saying this is the entrance to a World Heritage 74 Islands. 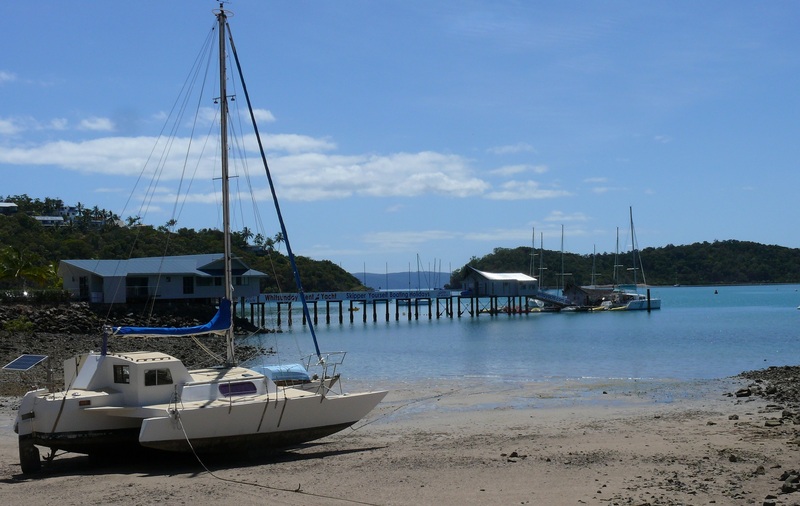 I have had a fondness for Shute Harbour since around 1985 when we caught a ferry from here to South Molle Island for a family holiday. Of course we have been to Shute Harbour many, many times over the years. Catamaran on the beach at Shute Harbour. In fact my yacht, ASTARET, was moored here for a few years. 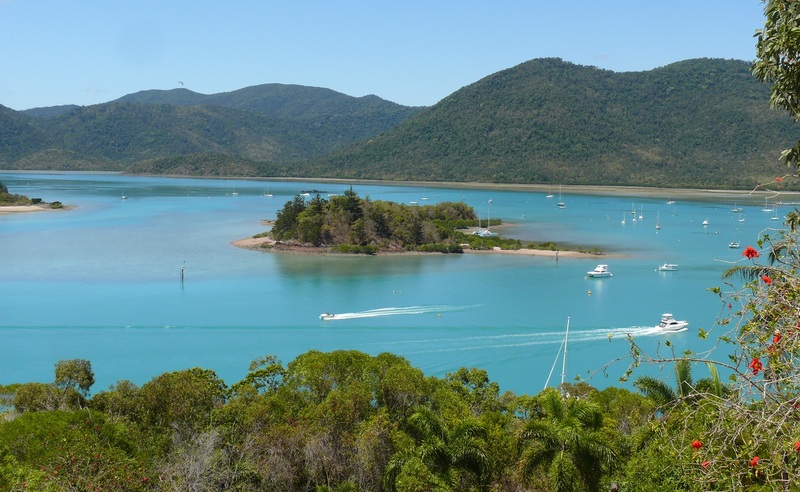 From a vantage point of the “upper carpark” can be seen what is known as Shute Passage, the southern end of South Molle Islands, several islands around the harbor, parts of Whitsunday and Hook Islands, Long Island and even the famous Hamilton Island in the heat haze distance. Looking towards Shute Passage and the south edge of South Molle Island. View from Shutehaven over Shute Passage. 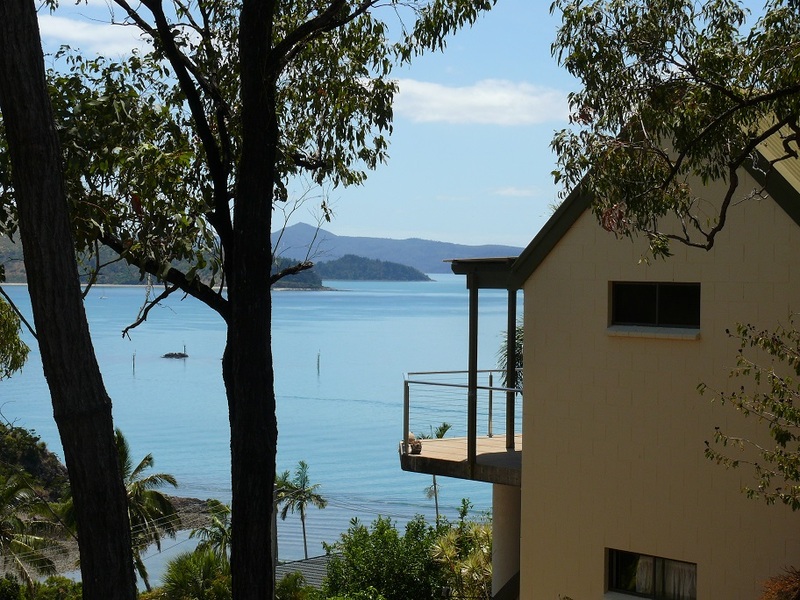 perched on impossible blocks overlooking the harbor and the Whitsunday Passage. Overlooking Shute Harbour and Tancred Island, Shute Island and Repair island and the mainland in the background. Shute Passage looking towards the North Molle Island and the South Molle Islands. 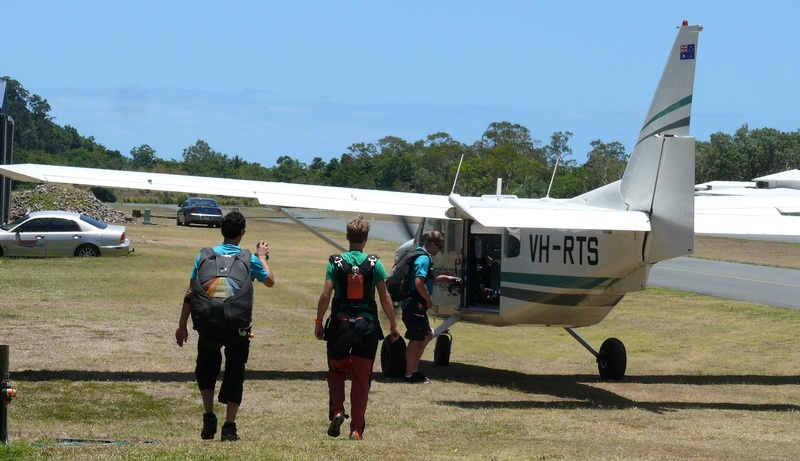 Next on my agenda was to visit Whitsunday Airstrip (right next door remember?) 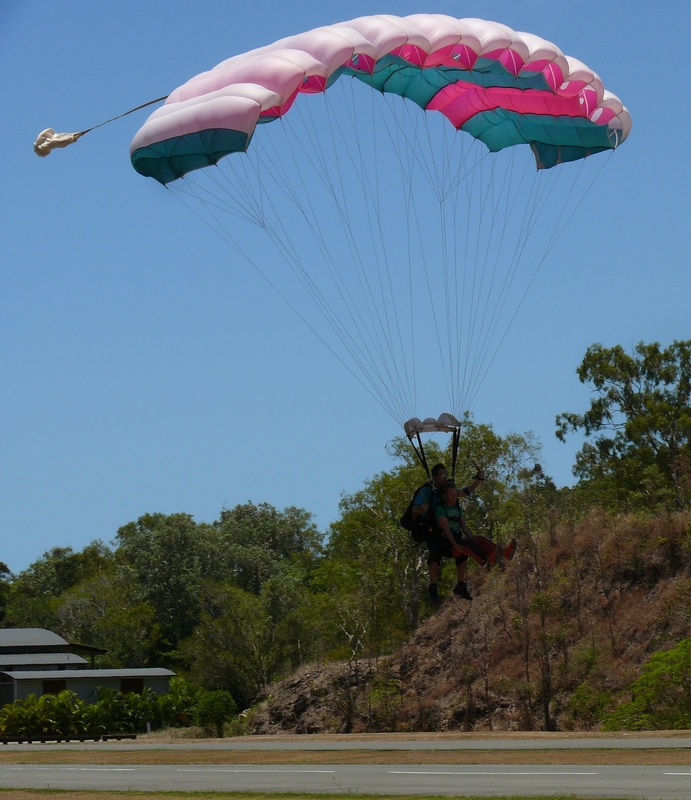 to see Skydiving Airlie Beach. Entrance to Whitsunday Airport and Whitsunday Airport Village Environment. Boarding the sky dive plane. and suddenly they are on the ground and chatting about the experience. 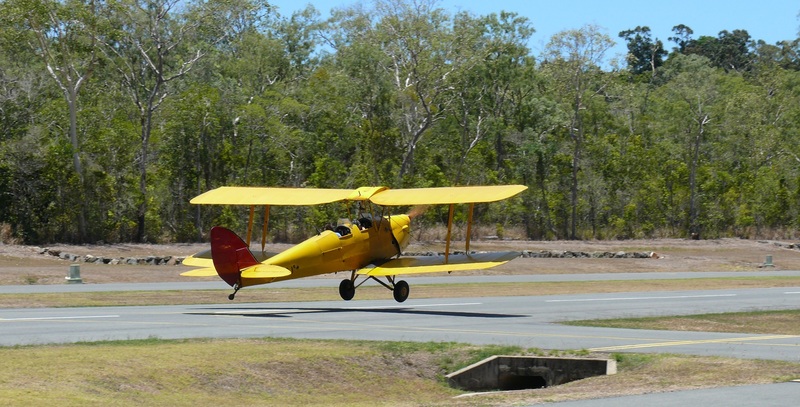 (they are dropped at 8,000, 10,000, 12,000 and 14,000 feet, each jumper chooses his/her limit) a local Tiger Moth airplane, noted for aerobatic flights over Airlie Beach, took to the sky. 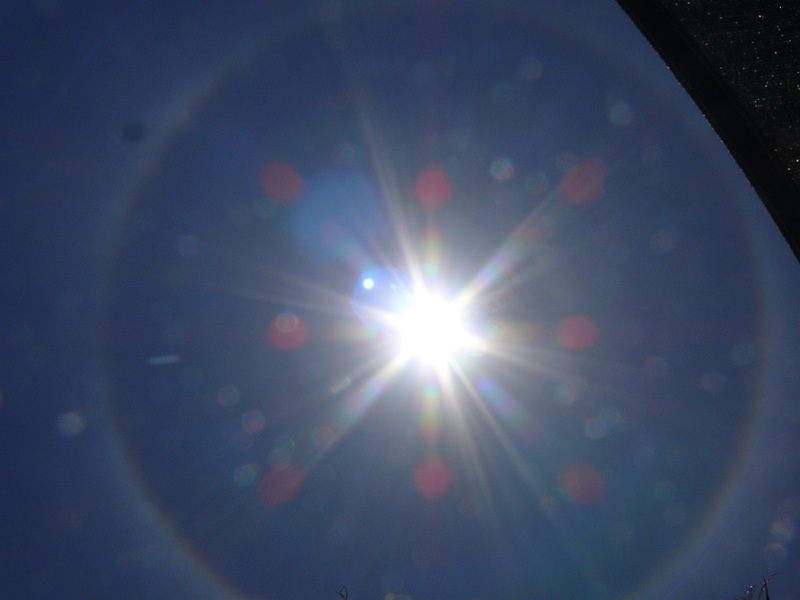 Also there was a halo around the sun which seems to have unsettled some of the jumpers. As always it was a hot day but pleasant in the shade around WWWGO and even nicer inside with the air conditioning turned on. In the afternoon we had a swim in the pool. This swimming in the afternoon is becoming a habit. It was another hot day and the threatening rain clouds at 5.30 am produced no rain. 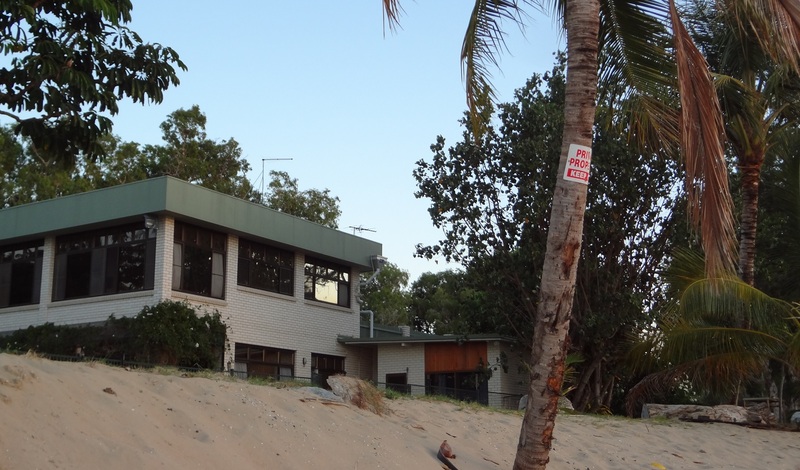 At 9am our Mackay Real Estate agent arranged for us to have a look through our house at Shoal Point. The first thing we noticed was the broken timber slat venetian blinds on four windows. We also found the towel rails in both bathrooms had been knocked off the walls. The shower rose in one bathroom was broken and on the shower floor. Some of the curtains were showing signs of wear and some of our quartz halogen down lights had been replaced by fluorescent globes and some globes have blown. Finally the kitchen range hood is falling out of its fitting. &%^$#@ hell! The managing agent is supposed to tell us about items needing repair or replacement. We went to Bunnings where we bought a curtain rod then visited Spotlight where we bought a set of block out curtains and returned to the house. We took down the broken venetian blinds, installed blackout curtains in the master bedroom and re-attached towel rails in both bathrooms and arranged for an electrician to sort out the light fittings and install a new range hood in the kitchen. We were so impressed with the block out curtains we drove back to Spotlight where we bought more curtains, a set of aluminum venetians and at Bunnings we found the shower head we forgot on the first visit. Then it was back to the house, install the shower head, the two sets of curtains and the venetians. When finished with those tasks I then adjusted the self-closer on the security screen and we finished our day after dark. We went back to the house to finish the block out curtains and review items of concern then sent a rocket email telling the agent we are unhappy with what they have not done. We went for a walk to our beach…Bucasia… and met three retired gents with their BloKarts http://www.blokart.com.au/ We had a conversation about how much fun they have riding the beach in their karts. In the afternoon we took the Subaru for a drive to Shoal Point to watch the sunset. I think at this point I should mention our beaches. 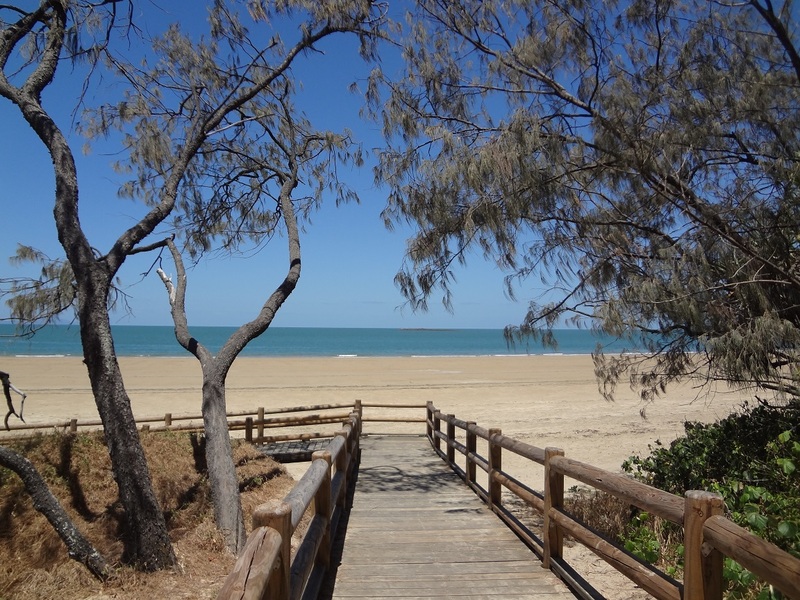 Firstly the beaches of Bucasia and Shoal Point are not like the beaches at say, The Gold Coast or Bondi. The Gold Coast and Bondi beaches are cleaned every morning. The sand is swept up where it is homogenized, pasteurized, vacuumed, swept, cleaned and respread in a whiter than white soft powdery sand with nothing to show the passage of tide, weather, people or time. Our local beaches on the other hand are as nature presents them, including wind-blown leaves and grass and tide deposited seaweed, shells, dead fish and other sea life along with flotsam and jetsam of the everyday life of the sea. They are honest to goodness beaches with hard packed sand along with a mix of muddy sand from nearby creek systems. In many cases, last night’s footprints and yesterday’s sand castles are still intact. Just before we went on our drive to Shoal Point I checked my mobile phone, which, as often happens, I put it down and do something else. Of course I always miss a call. This is the call I have been waiting on since Saturday. I have been waiting on this call and an email with an employment offer formal agreement. Now we have the agreement and a confirmed start date we have decided to hit the road on Thursday with Flame Tree Village as our destination. 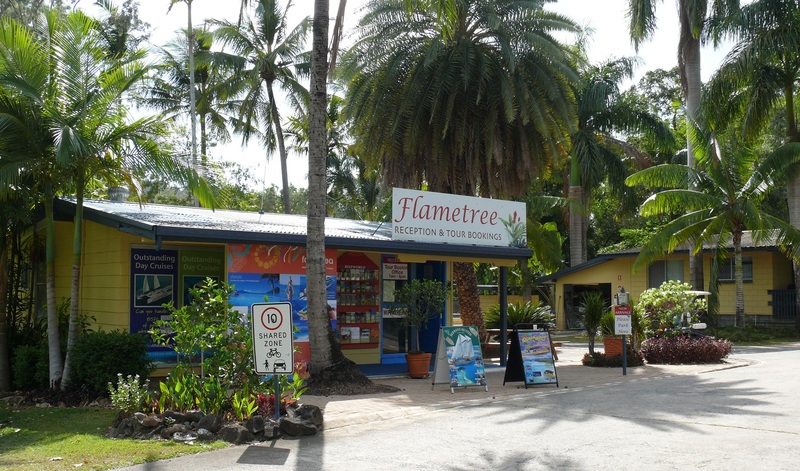 I will write more about Flame Tree later. On our walk we met an elderly retired couple. Hmmm! Some people might say WE are an elderly retired couple but I would respond by saying “We resemble that comment.” Umm Err should that be “we resent that comment?” The retired couple bought a house on a bend of land at Shoal Point thirty years ago from a builder who was going through the final stages of a Riches to Rags lifestyle. I recall the house thirty years ago when it was still owned by the builder and he kept his seaplane in his yard, tied to a palm tree. All he needed to do was untie, turn the plane around, start the motor, taxi to the water and he was away. He also kept his yacht at Mackay Harbour. He sailed around the world twice in that yacht, the voyages taking seven years. We sat on log chairs around a log table made from a Melalueca tree which a neighbor cut down earlier this year. Sacrilege I say, a crime against nature but at least some of the tree was saved and still serving a useful purpose. Once more we arrived home after dark. Shoal Point low tide and sunset. Today was a slow day. We didn’t do nuffin” Well not quite. We did prepare WWWGO, TERIOS and RALLYE for the trip to Airlie Beach. I start work as a casual on Monday. No, this is not the end of our travels. We will still have short trips, a bit like we did when we stayed at Culcairn NSW for three months in 2012. The work will allow us to finance some improvements to our houses and RALLYE and future longer travels in WWWGO. Niece Jo-Elle, Shan’s daughter has been entered in a Barista competition. She was a little reluctant to attend as she thought she had no chance of winning. An excited Jo-Elle called Shan to say she had won! Woo Hoo Jo-Elle. Way to go girl. We have a champion Barista in our midst! Thank you Shan for allowing us to set up camp at your house. We really appreciate spending time with you and the family. It was wonderful to have a friendly happy base in Mackay. In fact we have spent time with all three sisters and my brother over the last three years and we have enjoyed and appreciated the hospitality. Hmmm! Tonight will be Halloween and it is a good thing we will not be in the burbs when all the trick and treating is underway. 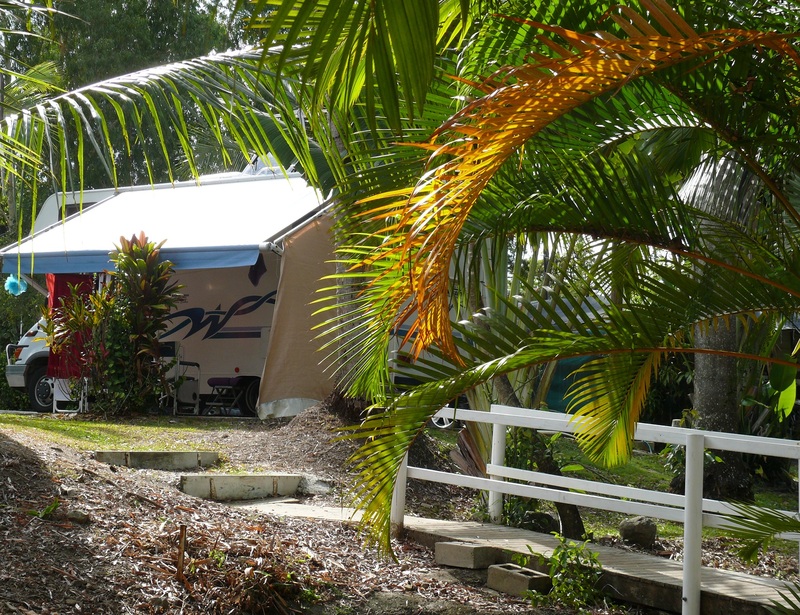 The caravan park is owned by a workmate from 40 years ago, Joe Browne and his wife and son and daughter. The park was a bit run down when they bought it but over the last 10 years they have sunk lots of blood, sweat, tears and money into the location. 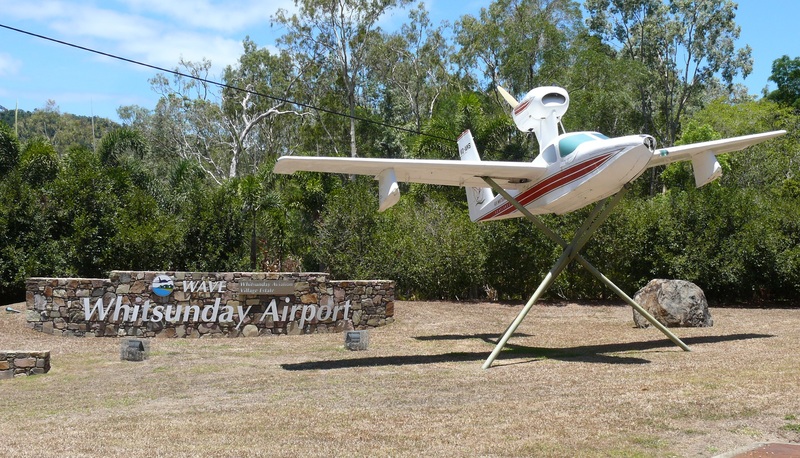 It is a little way out of Airlie and there is nothing of significance nearby…except the Whitsunday Airport which runs beside the park boundary. Whitsunday Coast Airport with Flametree Tourist Village about midway on the right beside the Shute Harbour Road and Shute Harbour in the distance. 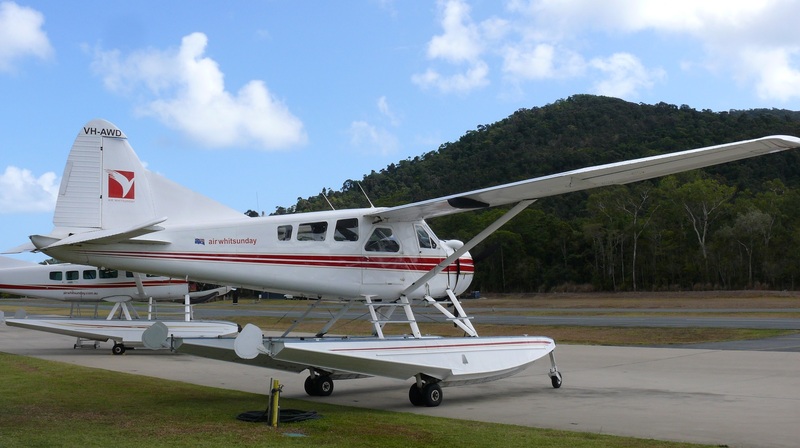 Lots of seaplanes call Whitsunday Coast Airport home. http://www.whitsundayairport.com/ The airport services lots of private planes, commercial small planes to the nearby islands and skydiving adventures plus is a helicopter training airport. All activity is over by 6pm and does not start until 7am so we will not be bothered at night. 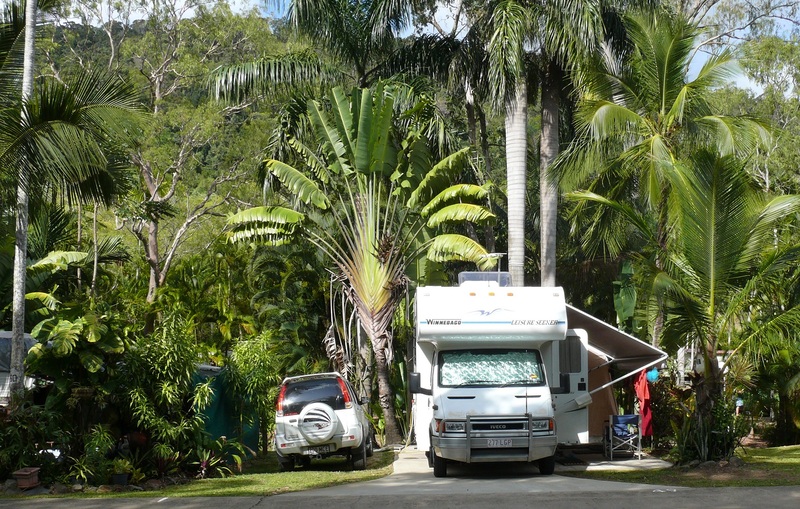 The park is set amongst a wet season creek meandering through rainforest. It is very pleasant has a “real” atmosphere instead of a sanitised sameness found in chain van parks. Looking across the creek at our site. It was overcast and hot when I woke and did my daily walk and exercises. During the morning the temperature rose above 31°. We met old friends, Ros and Lok S. They once had a hydroponic lettuce farm and supplied most of the restaurants in the area. Last year Ros developed cancer and her chemotherapy required the two of them to spend 6 months in Townsville. The business was shut down and Ros has won through and is in remission. They are now retired. The cloud built during the morning and rain began after lunch. The temp dropped to 27° and the wind swung from the north east to the south east. The ground around the area is so dry from many months without rain. Within an hour the hard, brittle, brown dry grass was turning soft underfoot. Perhaps we are now coming out of the dry season and entering the wet season. We have forgotten what summer in the tropics, in fact life in the tropics, is all about. In the tropics summer is always between 32° and 35° every day. Humidity runs between 75% to 97% and even 100%. For 9 months of the year you always know what to wear. The remaining three months we know to take a jacket in case it cools off in the evening. Winter is cold for about 3 consecutive days and then it is spring for the next 4 months. The rest of the time is summer! Donnis joined Ros and Lok for much of the day. I used the time to erect lots of shade cloth around WWWGO. Shadecloth view again from the creek. The extra shade is handy because our outside table and chairs can be in shade and any breeze is cooled before it reaches the table. We feel we have our own little piece of The Whitsundays and we are in such a nice place. The sun came out before lunch and the afternoon became just a beautiful blue sky without a cloud and a light breeze keeping us comfortable. While Donnis was away I received a call from her sister Linda who is currently in Hong Kong. Their cousin Wendy had a massive brain aneurism this morning and is in Vancouver Canada hospital and not expected to live. I broke the news to Donnis when she returned. Another bright sunny day of 32°. 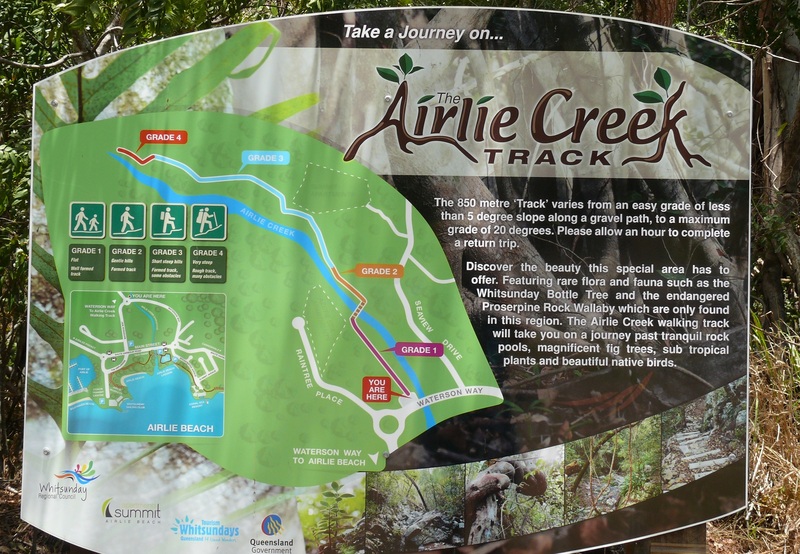 Mid morning we stopped to have a look at a new path along Airlie Creek.Track. We noted the track is rated 1, 2,3 and 4. Donnis did not wear appropriate shoes and by the end of the rated 2 track we realised she would not be able to continue. As well we were not prepared for heat of the mostly open grassland with little shade from trees. We also did not bring any water. We plan to do this walk another day, preferably early morning or late afternoon with correct shoes and plenty of water. 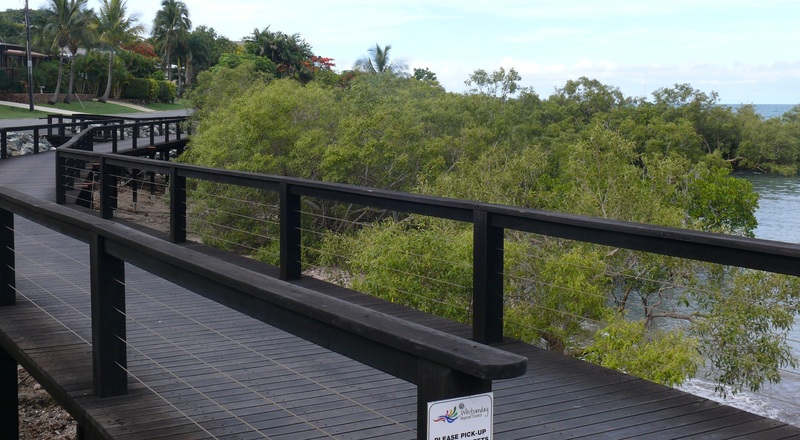 We also visited a new lookout built at one end of the main street and which overlooks Pioneer Bay. 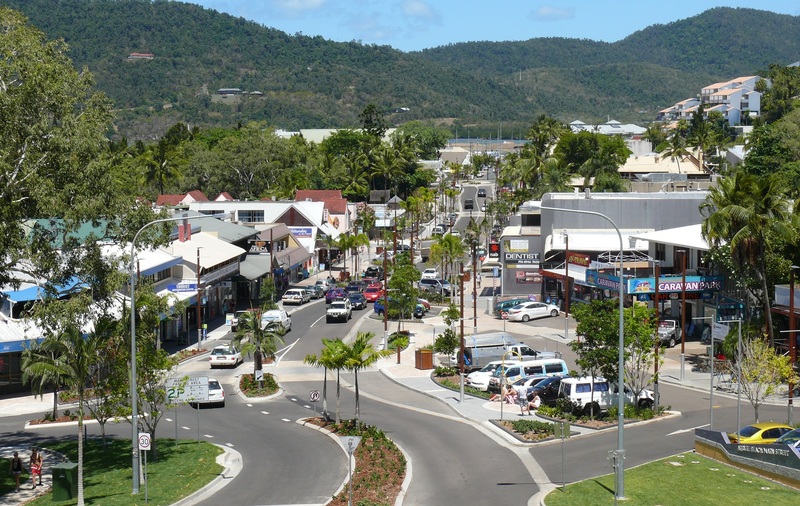 Panoramic view of Pioneer Bay and Airlie Beach main street. Best viewed full size by double clicking. We stopped at the shopping centre to buy some LPG and a few groceries. On the way into the centre we met Glen Patulo the former mayor of Proserpine, the Shire Council which includes Airlie Beach. Later in the centre we spoke with Henry and his wife. They were both Outrigger Canoe competitors in the days when we all thought physical punishment of our bodies was fun. Henry was born on the island of Hawaii but grew up in Tahiti and was always a fierce outrigger competitor. 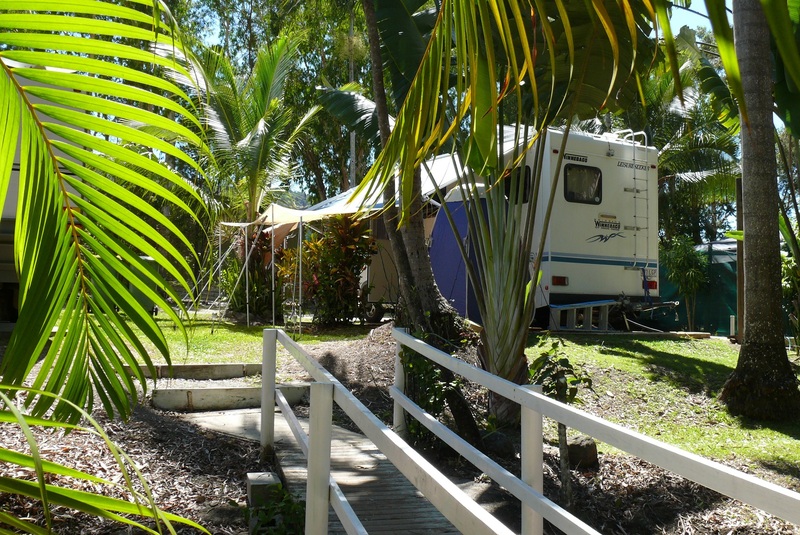 Donnis lived in the Whitsundays for 27 years while I lived here for 13 years. It seems every day we bump into somebody we know and in a town of around 8,000 people it is not difficult to know many of them. Most of the day we just relaxed around camp, talking with neighbours departing and new neighbours arriving. In the afternoon we had a swim in the pool. In the afternoon we received a call from Donnis other sister, Joan. Wendy died earlier today. This is a terrible bit of news and doubly so as Donnis best friend since childhood, Darlene, also died of an aneurism in March this year. Sisters and cousins at a wedding in Mexico 2013. 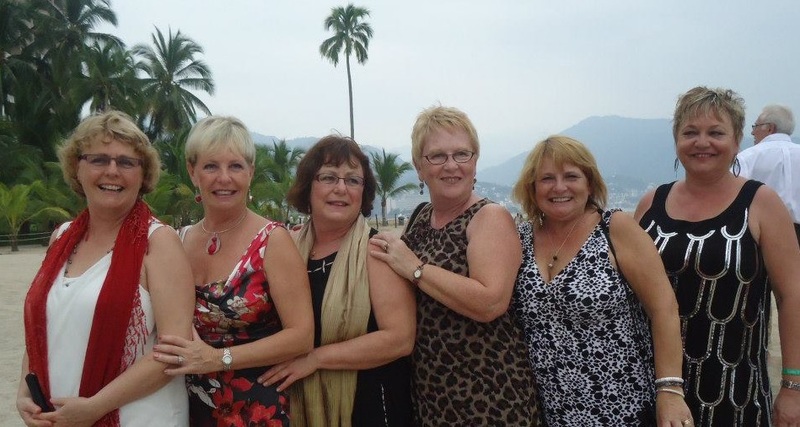 From Left to right sisters Donnis Linda and Joan with their cousins, sisters Jacqui, Wendy (deceased RIP Wendy) and Pat.